About Hotel: 4-Floors, 87-Rooms, Interior Corridors, High-Speed Internet, Indoor Pool, Fitness Center, Airport Shuttle, 100% non-smoking facility, Adjoining rooms available, Coffee/tea maker, Cribs available, Hair dryer, High-speed Wireless Internet access and data ports (complimentary), Iron/ironing board, Cable TV including HBO and a variety of other channels, Radio/alarm clock, Roll-away beds available, Suites available, Telephone with local calls (complimentary), USA Today newspaper; Mon-Fri (complimentary), 24-hour coffee, cookies and candy (complimentary), Deluxe breakfast buffet (complimentary), Fitness Center (available 24 hrs), Indoor pool (available 24 hrs), Laundry facilities, On-site parking (complimentary), Shuttle service to Salt Lake City International Airport and Lagoon Amusement Park (complimentary), Wake-up service, Whirlpool. Railroad View: Excellent View. 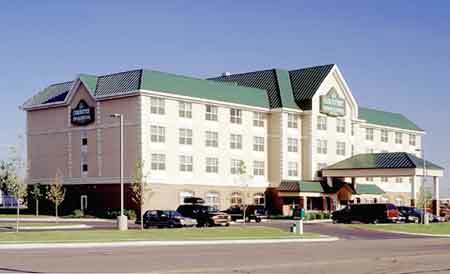 Ask for a room on the 4th Floor on the rear of the building (interstate highway side) for a railroad view. Lower floor rooms may have trees that could obstruct part or all of the railroad view. The railroad is just across I-15. Note: Only King Suite rooms face the railroad, rooms on the rear of the building are odd number rooms. These King Suite rooms have a sofa bed for guests that prefer two beds in a room. Windows do open all the way, protected by a screen. At night, it’s hard to see passing trains, no chance of shooting video during the night. It’s very hard to hear approaching trains with the highway noise from I-15; a keen eye out the window is useful. Northbound trains can be seen in the distance; south-bounds tend to surprise you. Railroads past Hotel: Union Pacific / UTA Front Runner (commuter railroad). Triple Track, You can expect around 20 Union Pacific freights during a 24-hour period and 50 Front Runner commuter trains (Monday to Saturday only), pretty much 4 trains an hour between 6am to Midnight. Front Runner trains do NOT operate on Sundays. 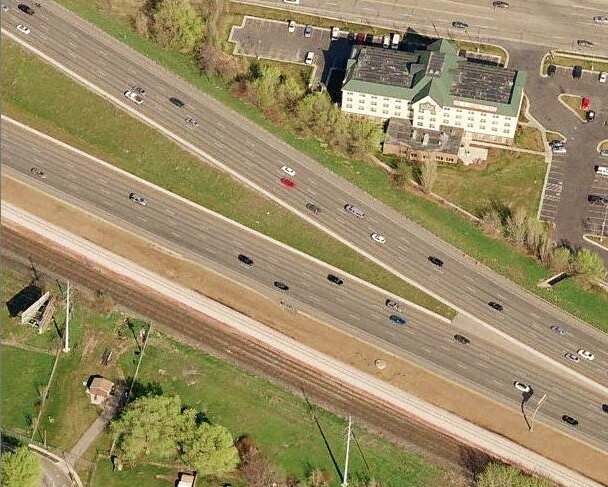 Photo Comments: Aerial Photo: The aerial picture shows the Country Inn & Suites located just across I-15. The closest track to the motel is the UTA Front Runner (white ballast), the 2-tracks next to the UTA line is Union Pacific's tracks, also used by Amtrak twice a day. The view is clear, but higher floor rooms are recommended to see above traffic on the interstate, and some tree tops. Train traffic in this area is rather busy with 70-trains a day on this route. Photo: Front Runner 21 - Great broadside photos can be takebn with a zoom lens from the motel. Here UTA's Front Runner commuter railroad engines # 21 zooms a 4-car commuter train to Ogden. All commuter trains I've seen were powered by these MP36 locomotives. Photo: View looking southwest catches this four car commuter train. During my visit in 2013, I was able to catch 4 of these trains an hour from the motel. These commuter trains run from 6am to midnight. Each commuter train I saw during this trip had the same 4-car set up such as the one here. The photo was taken from room # 401, which was an excellent room to watch trains from. All rooms on this side of the building are King Suites; rooms do have a sofa bed in them if you require two separate sleeping spaces. As you can tell, the trees between the building and the railroad are starting to get tall. In the future, these trees may downgrade the view from the motel. Only 4th floor rooms are above the treetops.